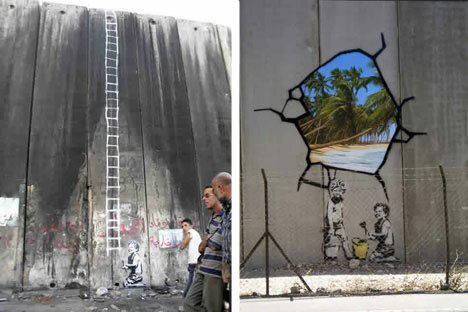 The internet has long been abuzz with Banksy, the world’s most infamous street artist. But what is the big deal about Banksy, where can you find his work and what has he said about his art to set the world to talking about it? 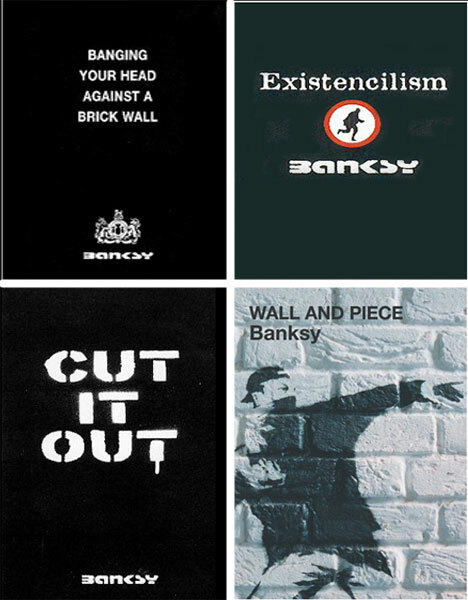 This thoroughly researched in-depth eight-part guide will walk you through the entire world of Banksy, from his stencil and graffiti work to prints, interviews, quotes, forums and other resources. Skim the overviews and click the links for more information. 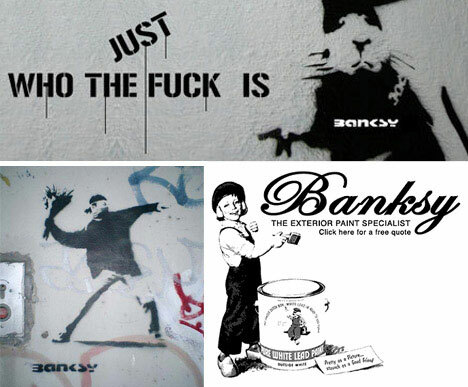 1) Introduction: Who is Banksy? In a world where the face of a politician, actor or artist is generally as widely recognized as their influence and work Banksy has struggled for years to maintain the mystery of his identity. He has created work around the world with messages ranging from subversive to downright silly but little is known for sure about his background – though much has been speculated and many have claimed to have figured out who he really is. 2) Banksy Graffiti, Stencils and Drawings: While he has subsequently become known for all kinds of installation art and other culture jamming projects Banksy has his roots in traditional graffiti, stencils and drawings. Much of his earliest – and now most valuable – work can be found scrawled in notebooks or on public walls around Great Britain. 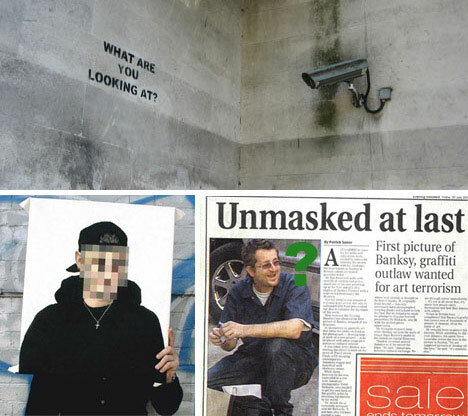 Extensive use of stencils in particular has helped Banksy work more quickly and maintain his anonymity. 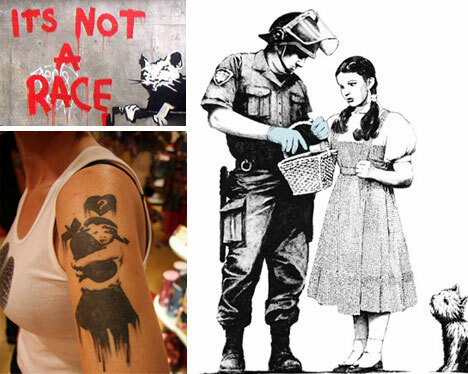 3) Banksy Photos, Prints and Tattooes:The growing fame of Banksy and his work has resulted in a huge following of people who have extensively documented his art with photographs, collected prints which he has sold and even gotten custom tattooes of his work put on their bodies. For many of his fans from around the world this is the easiest, best or only way to have contact with Banksy’s work which is far away. 4) Banksy Art Sold and For Sale: Along with his fame Banksy appears to have accumulate quite a fortune, with his work being shown in famous galleries around the world and purchased by collectors at astonishing prices. 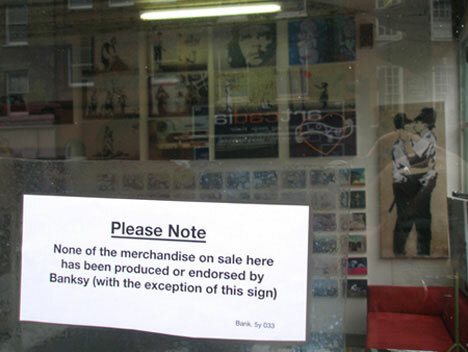 People who own Banksy pieces as parts of walls or as individual objects and drawing have been able to sell them for hundreds of thousands of dollars to famous collectors including Brat Pitt. 5) Banksy Interviews, Films and Videos: Despite his own camera-shy nature the elusive Banksy has been interviewed a number of times and is the subject of numerous films and videos. With his fame, however, he has also had to work harder than ever to avoid being unmasked, ducking out of interviews early or conducting them remotely – and always blurs out his face on the few videos that exist of him working. 6) Banksy Quotes and Sound Bites: Though many have derided him as an egotist Banksy is both clever and self-effacing when he speaks about his work. 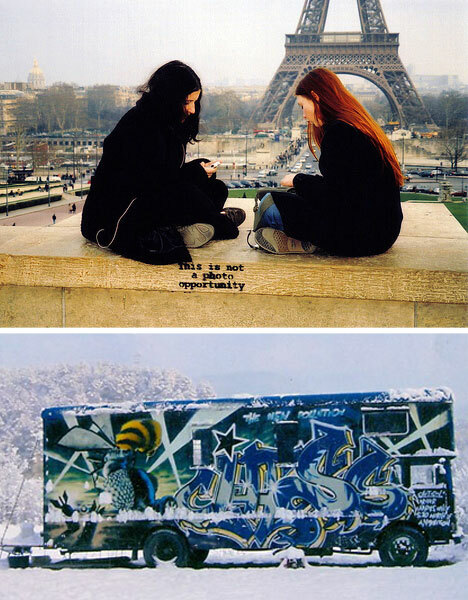 He is full of clever-but-meaningful quotes about the nature of his work as well as his opinions on graffiti and the artworld at large. He is at once crass but also deeply thoughtful in a way that those familiar with his work might not be entirely surprised by. 7) Banksy Books, Websites and Forums: As Banksy has become more popular, successful and influential a wealth of supporting material has sprung up around him. There are now books by him and by others about his work and ideals as well as websites and forums dedicated to discussing his art and motives. Some of these books contain glimpses into his past as well as full-color collections of his early works. 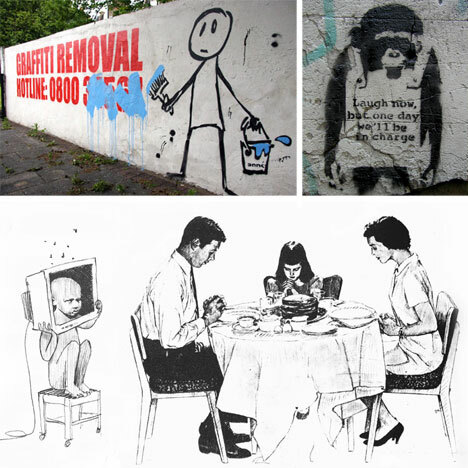 8) Banksy Art Locations Around the World: After all of this discussion of the nature of his work, his origins, influences, inspirations and opinions … where can you actually find Banksy’s work? As it turns out he has travelled extensively and managed to remain under the radar while doing so. This final article describes some of his most famous locations where you too can go and see the work of the infamous Banksy.